IT'S HERE! THE GREATEST VALIANT MILESTONE OF ALL TIME! 64 MASSIVE PAGES! For centuries, the sacred X-O Manowar armor has stood unrivaled as the universe's most powerful weapon. Today, will it equal Earth's doom? An unthinkable alien race known only as The Torment has come to our world in search of the armor's secrets. Now, they stand opposed by Aric of Dacia - former slave, noble warrior, resolute king, and current master of the armor's near-limitless capabilities. But is one man...and one weapon...enough to repel a force capable of leveling a thousand civilizations? A whole new era for X-O Manowar begins here...and you won't believe what's coming next! 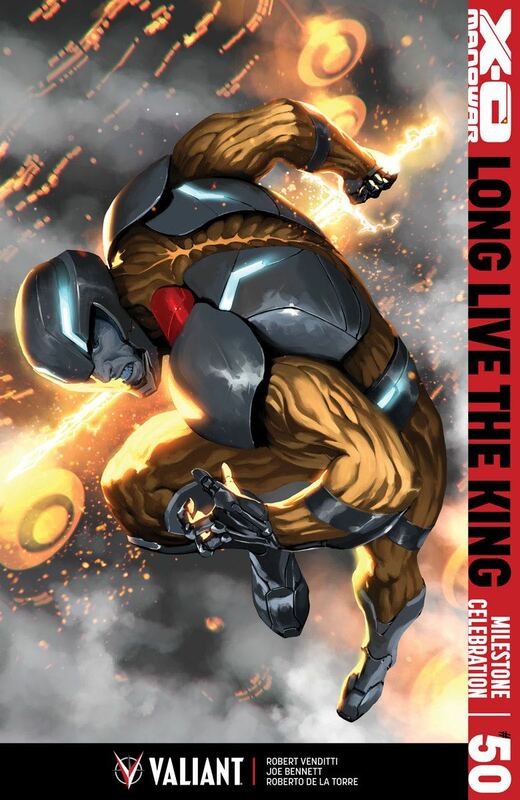 From all corners, the Valiant Universe assembles to salute X-O Manowar's unparalleled 56-issue run as Robert Venditti, Joe Bennett, and Roberto de la Torre declare "LONG LIVE THE KING" with an oversized series finale for the ages! Plus: all-new, never-before-seen X-O Manowar tales and tributes from Jody Houser & Javier Pulido, Matt Kindt & Tomas Giorello, and Philip Tan, and special guest appearances from X-O Manowar's own Cary Nord, Diego Bernard, Rafa Sandoval, Robert Gill, and more!